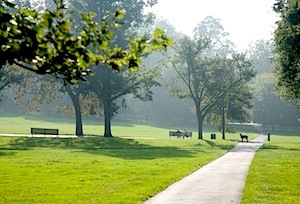 The trails, paths and greenways throughout Indianapolis provide homeowners wonderful park features, close to home. If you're thinking about buying a homes or condo in Indianapolis, you might want to consider how close the nearest trail or greenway is. Runners, joggers, bicyclists and even cross country skiers can be seen enjoying the trails and greenways around Indy. Approved for funding in 1836, the Central Canal was originally intended to extend 296 miles, running through Indianapolis from Peru to Worthington. Construction ended with economic crisis in 1839, leaving only eight miles in downtown Indianapolis that was operational. Towpaths were the roads or trails along the banks of the canal which allowed teams of horses or humans to pull, or tow, vessels along the canal. This rich history was the impetus for the Central Canal Towpath, an urban oasis which begins in Broad Ripple Village and runs south to 30th Street. The towpath is part of the Indiana Greenways Foundation. Keeping with its historical tradition, the towpath consists of a crushed limestone surface best suited for walkers, runners and cyclists. The Central Canal Towpath spans more than five miles and connects to the Monon Trail and White River Trail. The canal was designated an American Water Landmark in 1971, and includes two restored 19th-century bridges. One bridge connects to the grounds of the Indianapolis Museum of Art. Other popular sites along the trail include the campus of Butler University, IMA Nature Trail, Riverside Regional Park, Riverside Golf Academy, Marian College and the Christian Theological Seminary. Search homes in north Indianapolis neighborhoods or let us know what you are lookin for in your next home and we'll set up a search for you.